Nothing screams summer more than ripe, sweet peaches! 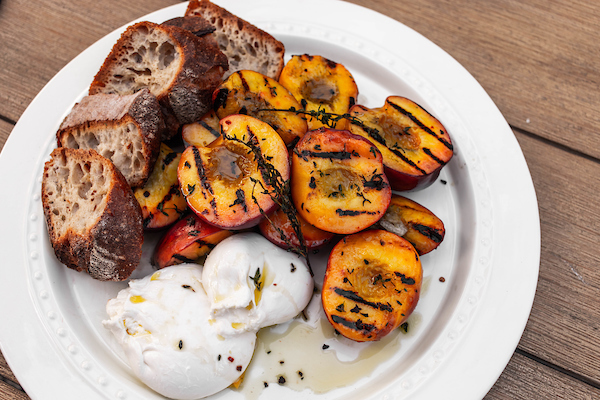 Chef / Partner Jeff Mahin of Stella Barra shares his favorite way to enjoy peaches in a savory dish set alongside fresh burrata. To download the Grilled Peaches & Burrata recipe, click here. 1. Marinate peaches for 30 minutes in olive oil with chili flakes, shaved garlic, thyme and black pepper. Peaches should be room temp. 2. Remove peaches from marinade and save marinade. 3. Place flesh side down on the grill for 30 seconds each side. Do not grill skin side. 4. Spoon marinade back over peaches. 5. Add sea salt to taste.